On 9th August 2006 a grand farewell programme of the 6th batch of Ahsunallah University of Science & Technology (AUST) was held at BIAM auditorium. The chief guest of the function was the acting VC Dr. Abu Md. Shadullah & the president of the programme was Dr. Mustafizur Rahman, the head of the department of textile technology. Dr. Mozaffor Uddin, the chairman of ITET & Dr. Aftab Uddin Ahmad of Sinha Group were the special guests. The function was started by the recitation from holy Quran. Then Zico a 5th batch student delivered his speech on outgoing students. After him the special guests & the president & the chief guest delivered their speeches and advise to the outgoing batch. At last Rumi Bhai, an outgoing student gave the farewell speech on behalf of his batch. In the end he became emotional and it was heartbreaking. After the finishing of all speeches the outgoing students were presented crests by the guests. Then a short break was taken. After the interval a cultural event was held. At first a 2nd semester student Tanvir enthralled the audience signing a famous Warfaze number. After that Shormi & Hasan sparked everyone by their Baul songs. A short drama was followed and again the crowd went crazy because of the songs"najane koi" of James by a 5th semester student. After that Mishkat a 1st semester student performed "shei tumi" and it was fabulous. Then a guest female vocalist presented Shakira's ever hit number "whenever wherever" and it was electrifying. The audience was booming with joy and especially Kabir Bhai enthralled the crowd by his dancing. Then a professional vocalist came to stage and she just increased the tempo by singing some hit Hindi & Bangla numbers like "dhoom, jhalak dkh laja, morar kokile" and so on. In the end the outgoing students went to stage and were presented bunch of flowers. The programme was well organized and enjoyable. Students of the Department of English, Dhaka University (DU) have organized a five-day charity film show for the cause of Lina, their classmate Shahed's sister. Lina is suffering from leukemia and needs to be sent to India for better treatment. The movie show has started from 2nd September and will go on till 6th September. Students of the Department of English, DU urge everyone to try and attend the show, and contribute something for the sake of Lina, who is still merely a college student. Tickets are priced at Tk. 30 and will be available at the show venue, R.C Majumdar Auditorium of Art faculty, DU. 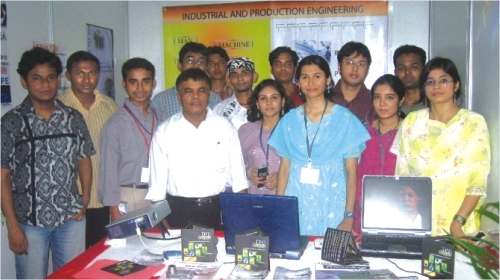 With a view to interac with stakeholder industries, students of the department of Industrial and Production Engineering (IPE), BUET took part in a 3-day long "2nd BSLF (Bangladesh International Export Services and Logistics Fair) 2006" under the banner of IPE Alumni, BUET. The fair was held in Hotel Sheraton from 17 to 19 August 2006. The fair also incorporated TEXTECH EXPO '06 and MACHINE EXPO '06. The students focused on the application of IPE in Logistics Industries. Like in many other countries, logistics industry is a sector with great potential in Bangladesh . This sector needs to be explored by Industrial and Production (IP) Engineers who can contribute immensely. Participation in such an event was very effectual in order to showcase IPE education and to establish the importance of this new breed of engineers. IPE Alumni Stall received enormous positive response from the visitors. They tried to convey their message to logistics companies such as MAERSK Bangladesh Limited, ABX International etc. The participants exhibited multi media presentations, video, flyers and publications on IPE applications. They also presented the positions and contributions of IP Engineers in local industries. The fair was a fabulous success and hopefully, IP Engineers created a good impression. As it was a Business to Business (B to B) fair and mainly Garments and Textiles Technology, Machinery were being exhibited, quite a number of executives from this sector visited the stall. Visitors also included entrepreneurs, business consultants, engineers and students. They expressed their views on, problems with and expectations from young IP Engineers. IPE is a relatively new discipline in Bangladesh. It blends engineering with business studies and management. This, in the context of Bangladesh, is of utmost importance for the proper operation and efficient expansion of any industry. This discipline requires widespread promotion to introduce and establish its importance in the industrial arena of the country. This awareness needs to be created for the sake of the industries themselves, so that they can provide more from less. Being a society of vibrant and educated youths, IPE Alumni, BUET is continually working to represent and promote BUET IPE in Bangladesh. The participation in 2nd BLSF was one such approach in their efforts towards bridging the gap with stakeholder industries. The Department of Computer Science & Engineering of Northern University Bangladesh inaugurated “1st Software Fair 2006” on 26 August at the Main Campus 3/18, Iqbal Road, Mohammadpur, Dhaka. Professor Mohammad Ali, Vice-Chancellor NUB inaugurated the fair as chief guest. Professor Dr Nurul Islam, Dean, Faculty of Science, Md Lutfor Rahman, Director, HRD, Md Solaiman Miah, Registrar were present as special guests. Teachers and students of CSE department took part in discussion at the ceremony. Professor Mohammad Ali expressed that the demand and opportunity in the Software market of Bangladesh is increased day by day. So, we have to take our best care to develop need-based software for our country as well as for the overseas market. In the fair, 15 need based softwares developed by NUM students of CSE department were displayed. United International University (UIU) has organised a weeklong event at UIU campus starting from 3 September. The programmes will continue till 8th September. All the leading private Universities including North South University, BRAC University, Stamford University, Northern University, Independent University will take part in the events. The events will feature games and sports, 2nd UIU debate championship'06, UIU-Banglalink table tennis championship'06, workshop on music, film show, drama, magic show, discussions and cultural programmes. The debate championship will feature participation by more than 30 teams. The final round and prize giving ceremony will be held on 7th September. The film show will be held at September 6 and 7. Some of the box office hits including The Massage, The Last Samurai, The Matrix, Home Alone, The Musk, Share Cuattor (Bangla), Bachelor (Bangla), Rang De Basanti (Hindi) will be shown. Game show will be held on September 6 and 7 at 3:00 pm. starting with a quiz round on IT and other topics. Those who will get through the quiz round will be able to participate in game show. This is an open to all event. The magic show will start at 4:00pm on 6th September. Also a daylong blood donation programme will be held on 6th September. One of the most attractive events is the three daylong Software Fair and a daylong programming contest starting from 6th September. Also a computer gaming contest will be held on September 7 at UIU computer lab. UIU drama club will stage the drama <>Molua<> from <>Mymensingho Geetika<>> and a special concert on September 7. The weeklong event will end on 8th September with cultural programme named "UIU- Spirit" featuring songs, dance, short drama by UIU students. As the host UIU will compete in all the events. United International University (UIU) hosted a seminar on Career Development on August 20. Mr. M Aminul Haque head of Human Resources, Standard Chartered Bank was invited by UIU to discuss on the topic. "We arrange such discussion sessions on regular basis so that students can be guided at the right path." Said Sohel Iqbal public relations officer UIU." It is very important for a student to use his knowledge in a proper way and we hope that such seminars will help a student to take the right decision" he added. Various issues related to career build up were discussed at the event. "To secure a bright future a graduate must have a good academic background but apart form academic background he must also be able to work as a team member, a good communicator, a leader and of course very sincere" said Mr. M Aminul Haque. The discussion session was followed by a short question answer session. Students discussed about various problems which they face and solutions. Prof. Dr. Habibur Rahman Dean of Business School of UIU presided over the event. The seminar was opened to all.